Guatemalan authorities have increased the confirmed death toll from the eruption of the Volcano of Fire to 69 as officials suspended the search until dawn on Tuesday. Fanuel Garcia is the director of Guatemala’s National Institute of Forensic Sciences and he announced the higher death toll late Monday. He said only 17 of the dead have been identified so far. The burning ash and mud that engulfed villages on the volcano’s flanks Sunday left many victims unrecognizable. They will have to be identified through DNA testing or other means. A lack of electricity in the most heavily hit zone makes safely searching at night impossible. Guatemala’s disaster agency has raised the death toll from the eruption of the Volcano of Fire to 65. The agency says in addition that 46 people were injured. Nearly 2,000 people are in shelters and more than 3,200 were evacuated from the areas near the volcano west of Guatemala City. The volcano erupted Sunday, burying people in ash and searing mud that raced down its flanks. Few of the bodies have yet been identified because the intense heat left them unrecognizable. The known death toll for the eruption of Guatemala’s Volcano of Fire has taken a sudden jump upward. The volcano west of Guatemala City staged and explosive eruption Sunday, burying surrounding hamlets in hot ash and mud that gave residents on the volcano’s flanks little time to escape. 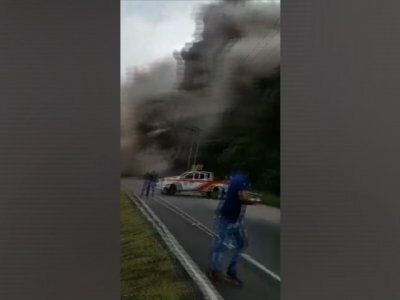 The head of Guatemala’s disaster agency says 33 people are confirmed dead in the explosive eruption of the Volcano of Fire, and the toll is expected to rise further. Rescuers are using heavy machinery and shovels have found the bodies of at least eight more victims since the last death toll was given at 25. Disaster agency chief Sergio Cabanas also said Monday that helicopters had rescued 10 people from areas hit by thick ash, mud or lava. The volcano exploded Sunday, sending ash high into the sky and lava flows cascading into rural hamlets on the mountain’s slopes. Guatemala City’s international airport has re-opened after it was closed by falling ash from the eruption of the Volcano of Fire to the west. The airport’s press office says the facility was reopened Monday after ash was cleared from the runway. However, the airport press office says each airline is free to make its own decision about whether to resume flights. Fine, gritty volcanic ash can damage jet engines. Rescuers have found the bodies of several more victims of an eruption at Guatemala’s Volcano of Fire, and emergency workers have pulled 10 people still alive from ash drifts and mud flows. The official death toll stood at 25 Monday morning, but Associated Press journalists saw several more burned and ash-covered bodies being unloaded after they were dug out in the village of El Rodeo. Disaster agency chief Sergio Cabanas says rescuers using helicopters have rescued 10 people from areas hit by thick ash, mud or lava. In the Guatemalan village of El Rodeo, heavily armed soldiers wearing blue masks to ward off the dust are standing guard over a community hit by a volcanic eruption that has killed at least 25. Some locals say they didn’t learn of the danger until it was upon them. A group of residents arrived at the scene of the lava flow Monday with shovels and work boots to help the search for survivors and victims. Guatemalan officials say more than 3,200 people have been evacuated due to a volcanic eruption that has killed at least 25 people. The country’s disaster agency said Monday that the death toll remains at 25, though there are apparently people still unaccounted for. The Volcan del Fuego burst into eruption Sunday, hurling ash 14,700 feet (4,500 meters) above sea level and sending flows of pyroclastic materials down its flanks into nearby towns. Guatemala’s volcanology agency says the eruption had calmed by about 10 p.m. Sunday (4 a.m. Monday GMT). Israel says it has delivered food, blankets and medicine to Guatemala after a volcano erupted there, killing at least 25 people. The Volcan de Fuego, or “volcano of fire,” exploded in a hail of ash and molten rock Sunday, blanketing nearby villages in heavy ash and sending lava flows down the mountain’s flank. Disaster agency spokesman David de Leon said late Sunday the bodies were found in the community of San Miguel Los Lotes. Seven deaths were confirmed previously. The Volcan de Fuego, or “volcano of fire,” exploded in a hail of ash and molten rock shortly before noon Sunday, blanketing nearby villages in heavy ash. Then it began sending lava flows down the mountain’s flank and across homes and roads around 4 p.m.